The Carbon Mineral Challenge has now documented 28 new carbon minerals since the program’s launch in December 2015. Project lead Daniel Hummer (Southern Illinois University, USA), is taking stock of the discoveries as the program enters its final six months, but in the meantime, here’s a survey of the latest 11 minerals. Each is packed with its own story and surprise. The new minerals have been unearthed in a variety of environments, from subarctic peaks to desert cliffs, from abandoned mines to outer space. Aravaite was described by Evgeny Galuskin (University of Silesia in Katowice, Poland) and colleagues near the Arava Valley, after which it is named. Arava, or Arabah, is a desert that forms part of the border between Israel and Jordan. Vladimir Karpenko (Fersman Mineralogical Museum, Russia) and his team uncovered akopovaite near the Asan-Usan glacier in the Batken Region of Kyrgyzstan. Šlikite was described by Jiří Sejkora (National Museum, Czech Republic) and his colleagues in samples from the ore mining region around Jáchymov, Czech Republic. 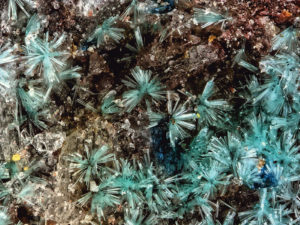 A sample of fiemmeite was collected by Francesco Demartin (Università degli Studi di Milano, Italy) and his co-authors in an old mine in the carbonate-rich Dolomite Mountains of northern Italy. The Dolomite Mountain region is famous for its contribution to mineral rosters, including a second instance of the mineral middlebackite, a carbon mineral verified in 2016. Meteorites have delivered all manner of treasure to Earth, including diamonds and gold. In the case of the Wedderburg meteorite, the prize was the new mineral edscottite, which was discovered by Chi Ma (California Institute of Technology, USA) and Alan Rubin (University of Los Angeles, USA). The small, corroded meteorite was found along an Australia roadside in 1951. 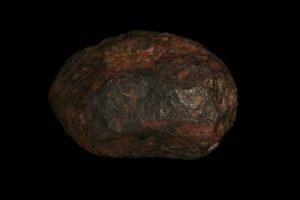 It carries traces of gold, iron, kamacite, schreibersite, taenite, and troilite, and now edscottite—the object’s first carbon-bearing mineral. Meyrowitzite, uroxite, and psuedomarkeyite join the rapidly expanding family of carbon minerals that contain uranium. This family continues to grow thanks to ongoing exploration of former uranium mines in the deserts of the United States Southwest by Anthony Kampf (Natural History Museum of Los Angeles County, USA) and colleagues. Meyrowitzite is named for American analytical chemist Robert Meyrowitz (1916-2013) who worked on the Manhattan Project that produced the first nuclear weapons during World War II. After the war, he joined the United States Geological Survey. Uroxite, 0.68mm FOV. Photo by Anthony Kampf. Uroxite is named for its composition. It is the first natural uranyl (ur) oxalate (ox), and the first organic uranium mineral ever found. Kampf and colleagues discovered it on consecutive days in mines 136 kilometers apart. Speaking of families, psuedomarkeyite could be considered previously discovered markeyite’s twin brother. Both minerals occur in close association and are similar in appearance, composition, Raman spectra, and structure. Davidbrownite. The deep blue crystals in the image are antipinite. Photograph by Anthony Kampf. Kampf and Joe Marty (University of Utah, USA, retired) have expanded their focus into the Rowley Mine area of the Painted Rocks Mountains of Arizona. There they unearthed the phosphate oxalate mineral phoxite in a hot and humid part of the mine in guano and post-mining deposits. Phoxite crystals comprise portions of the interiors and rims of circular masses that are presumably bat excrement. 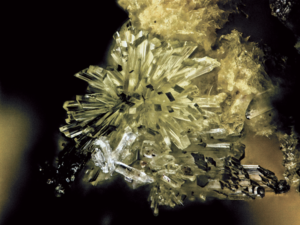 Kampf notes that several samples from this unusual assemblage are under study and have already produced an additional carbon-bearing oxalate, davidbrownite-(NH). Another oxalate, alterite, was named in honor of long time Arizona field collector Malcolm Alter. Alterite is the 23rd oxalate species, and the first natural zinc oxalate mineral to date. Robert Downs (University of Arizona, USA) and his lab led the analysis on the new mineral. Downs is a co-author of the paper that launched the Carbon Mineral Challenge.